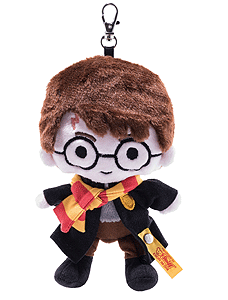 Pendant Harry Potter is hand made in the finest multi-coloured cuddly soft plush. On his eleventh birthday, Harry Potter learns that he has been accepted to Hogwarts School of Witchcraft and Wizardry. Harry and his friends, Ron and Hermione, brave the challenges of school life while facing the increasing threat of the Dark Forces. As Voldemort returns to power, Harry realizes that only he can stop the Dark Lord.